I have a love/hate relationship with my GPS. I'm thrilled to have it, and it has gotten me to many locations I was totally clueless about. But, then again, it has taken down roads that were no where near my destination. Sometimes it has led me to places I have been totally unfamiliar with. So, you see my love/hate situation. 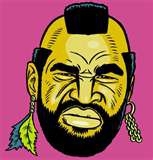 Mr. T - "I pity the fool that doesn't turn right!" What about Dr. Phil - "Alright, so your life is on a straight path, but you've got to turn right up here. How's that make you feel? Turn right! OK, you didn't turn right. You're going the wrong way. You know that don't you? You do? Well, how's that working for you? Paula Dean - "Hey, y'all . . . we're fixin' to turn right just up ahead there, so keep your eyes open . 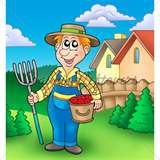 . . "
Farmer, "Go to the oak tree on the south-side of the 'Y' up there. Turn right at the new fence posts. You know, since that city slicker ran through the fence last September that fence has been down. Don't know why it's taking so long to get it fixed. Do they think the cows are gonna stay in there because they're loyal?" Mushmouth (from Fat Albert) "Hey-ba man-ba turnin' rightca up here . . . man ba. Jack Bauer (24) - "I Know this is a lot to deal with right now, but you have to focus. There's a right turn up ahead. You need to take that. When you get to the corner, turn right and keep going. Don't look back!" Clint Eastwood - "There's a right turn up ahead, so you have to ask yourself. Do you feel lucky? Well, do ya, punk? Take the turn. Go head. Make my day!" Ozzy Osbourne - "Mumble, mumble, mumble, mumble . . . SHARON! You missed the blooming turn again." Well, you get the idea. As an independent realtor, I need good directions to make my work flow smoothly. My GPS has been an essential part of that work flow, but if it's going to keep getting me lost I'll settle for an entertaining voice. Mandy, your days may be numbered. Who's on your list? Absolutely, Cyndi. I appreciate Mandy's help, but sometimes she just talks too much!! I was going to buy the life time update program for mine but it cost as much as a new GPS. But still less than buying a new one every other year. Mine talks too much sometimes.